The cockpit takes a fresh, bold approach with sumptuously contoured seating, precision contrast stitching and color accents that speak volumes in styling expertise. Recessed lumbar areas convey a completely new design theme, and the 24 drinkholders throughout the bow and cockpit offer plenty of places to set your drink as you enjoy the ride. 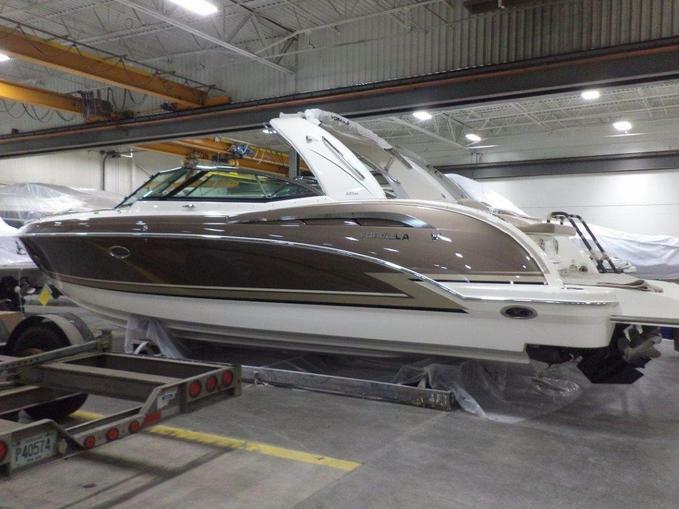 Storage is at every turn for all your boating gear, under seats, in lockers and in the floor. The molded cockpit wetbar features an integrated sink, Corian countertop, 17.5-quart cooler, trash container and an optional fridge. A roomy portside lounge along with the U-shaped lounge aft expand the comfortable, spacious seating, while the dual-height tables and filler cushions adapt to fit various on-water activities you and your guests may choose. The bow of the boat is a seamless transition from the cockpit with a flush floor all the way to the bow. Seating is plentiful, yet convertible to a spacious sun lounge with a double-wide lounge seat to starboard, two dual height tables and wrap-around seating with filler cushions. A comfortable armrest on the starboard folds up when not in use. An Igloo cooler in the bow keeps drinks and snacks chilled and ready to refresh the crew at all times. Entering the cabin through the centerline door at the helm, three solid wood steps lead down to reveal woodgrain-finish flooring and a full 5’10” of headroom. The doublewide lounge, cedar-lined hanging locker and AM/FM/CD stereo changer are to starboard. The cabin features a mini galley at centerline, similar to a private aircraft, with a microwave, neatly concealed sink and a pull-out stainless steel refrigerator. A full bank of galley drawers, storage cupboard with wastebasket and paper towel holder and an optional HDTV/DVD combo are to port. The spacious head features a molded vanity with Corian countertop, sink, shower and Vacuflush head unit, plus plenty of storage. Through the clever utilization of space only Formula’s unique Crossover Bowrider layout provides, a full-size double berth with Sensus memory foam mattress is located aft, so there is no need to convert a lounge for sleeping. The cabin is perfect for overnight trips or taking a break from the sun, with room to stretch out and relax. The 21 deg; deep-V hull gives a smooth, stable ride and is perfectly complemented by powerful twin Merc or Volvo engine packages, delivering the swift, smooth performance you crave. This smartly balanced combination of bow and cabin space in the amenity-packed Formula 350 CBR takes you anywhere you want to go with speed, style and comfort. Balance of the 5-year Formula Guard Protection thru 4/23/2019.